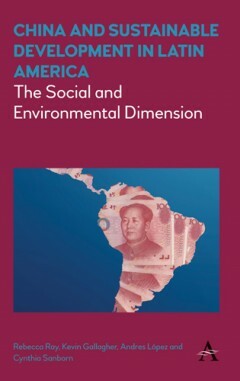 China and Sustainable Development in Latin America documents the social and environmental impacts of the China-led commodity boom in Latin America. It also highlights important areas of innovation where governments, communities and investors have worked together to harness the commodity boom for the benefit of the people and the planet. During Latin America’s China-led commodity boom, governments turned a blind eye to the inherent flaws in the region’s economic policy. Now that the commodity boom is coming to an end, those flaws cannot be ignored. High on the list of shortcomings is the fact that Latin American governments—and Chinese investors—largely fell short of mitigating the social and environmental impact of commodity-led growth. China and Sustainable Development in Latin America documents the social and environmental impact of the China-led commodity boom in the region. Primary commodity exploitation—of petroleum, copper, iron ore, tin, soybeans and the like—are endemic to environmental degradation. The recent commodity boom exacerbated pressure on the region’s waterways and forests and accentuated threats to human health, biodiversity, global climate change and local livelihoods. China and Sustainable Development in Latin America also highlights important areas of innovation, like Chile’s solar energy sector, in which governments, communities and investors have worked together to harness the commodity boom for the benefit of the people and the planet. It is imperative that Latin American governments put in place the necessary policies to ensure that economic activity in natural resource sectors is managed in an environmentally responsible and socially inclusive manner. China and Sustainable Development in Latin America aims to highlight the efforts that have borne fruit as well as the areas that still need attention. Without proper policies in place to make sustainable development part and parcel of economic decision-making, Latin America will continue to be plagued by commodity boom and bust cycles that accentuate social and environmental conflicts and are ultimately detrimental to long-term prosperity. Rebecca Ray is a research fellow at Boston University’s Global Economic Governance Initiative and a PhD student in economics at the University of Massachusetts Amherst. Kevin Gallagher is Professor of Global Development Studies at Boston University’s Frederick S. Pardee School of Global Studies, and Co-director of BU's Global Economic Governance Initiative. Andrés López is a full professor of development economics and head of the economics department at the University of Buenos Aires as well as the executive director of the Red Sudamericana de Economía Aplicada. Cynthia Sanborn is Professor of Political Science and Vice President for Research at the Universidad del Pacifico.